Cookies are small files, composed of a string of letters and numbers, sometimes located on your computer by web page servers. They allow the website owner to distinguish you from the other users of the site. Cookies can not be executed as code and do not incorporate viruses that allow us to access your hard drive. In this way, we can not access the information on your hard drive, even if cookies are stored on it. For strictly necessary uses: These cookies are essential for you to navigate through the website and use its functions, such as access to secure areas of the website, remember the items on your shopping list, remember at what point of the order you are. Performance: Cookies collect information about how visitors use a website, for example, pages that visitors go more often and if they receive error messages. These cookies are used to improve a website in future versions, improve the user experience, improve the functioning of the website by reducing the time it takes to load the pages you visit. Targeting or advertising: These cookies are used to deliver the most relevant content to you and your interests. We do not allow third parties to advertise on our website, but we can not control advertisers that are allowed by Internet service providers to advertise while browsing the Internet. This website uses both temporary session cookies and permanent cookies. Session cookies store data only while the user accesses the Web and permanent cookies store the data in the terminal to be accessed and used in more than one session. Are those that allow the user to navigate through the website or application and the use of different options or services that exist therein. For example, control traffic and data communication, identify the session, access restricted access Web Parts, remember the elements that make up an order, make the application for registration or participation in an event, use security elements during the browsing and storing contents for the dissemination of videos or sound. Are those that allow the effective management of advertising spaces that have been included in the Web page or application from which the service is provided. They allow to adapt the content of the advertising so that it is relevant for the user and to avoid showing ads that the user has already seen. They are those that allow tracking and analysis of the behavior of users on Web sites. 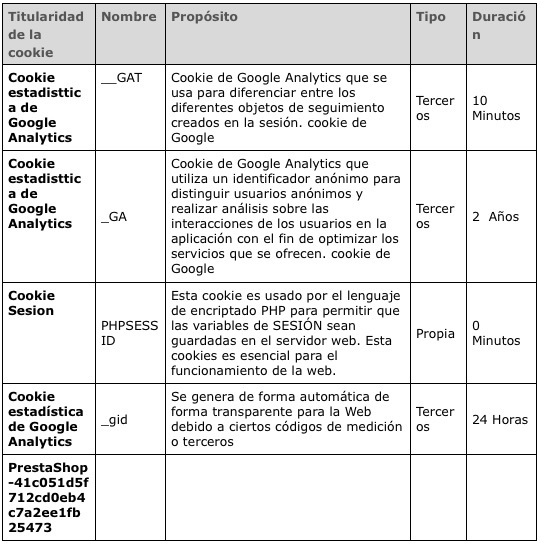 The information collected through this type of cookies is used in the measurement of the activity of the Web sites, application or platform and for the elaboration of navigation profiles of the users of said sites, in order to introduce improvements in the service according to of the usage data that users make. In some web pages you can install third-party cookies that allow you to manage and improve the services offered. Like, for example, Google Analytics statistical services. The user has the option to allow, block or eliminate the cookies installed on his computer by configuring the browser options installed on his terminal. Finally, you can go to the portal Your Online Choices Choices where in addition to finding useful information, you can configure, provider by supplier, your preferences about third-party advertising cookies. In some browsers you can configure specific rules to manage cookies per website, which offers more precise control over privacy. This means that you can disable cookies from all sites except those that are trusted.